When my husband and I recently traveled to Athens, we had one thing in mind. We weren’t there to set sail to the famous Greek islands, or even see historical ruins. We were there to sit in a Greek café, rest, relax, eat snacks and drink Greek wine and ouzo. Our version of a relaxing vacation is to take our time and treat ourselves to good local food and hiking around a city all day. Our favorite eateries in the Greek capital weren’t fancy restaurants or wine bars, or the tourist-packed shopping area beneath the lights of the Parthenon. Rather, we became enamored of the little neighborhood taverna two doors down from our student apartment Airbnb. There we sat and ate three things: Greek salad; garlicky tzatziki served with toasted crostini bread; and a savory phyllo dough and cheese pie with sautéed leeks—all served alongside a small pitcher of local house wine straight from a barrel. I had been making spanakopita for years before I ever set foot in Greece, but now I had an accurate food memory to draw from; this has changed the way I make Greek food. Occasionally, I will prepare “Greek Food Night” for my family, where I make a meal of Greek appetizers—including all the foods mentioned above—and dessert, too. Also, I am not a fan of rose water, frequently a main element of the baklava syrup used throughout Israel. A good alternative is orange blossom water, or mei zohar (literally, “wonder water”). If you have ever had an orange tree in your back yard, then you know the unmistakable and intoxicating smell that orange blossoms lend to the springtime breeze. Orange blossom water is just what it sounds like: orange blossoms that have been plucked (or collected as they fall) and steeped in distilled water until they expel their potent fragrance. I will warn you now that you only need the smallest amount for your syrup—it’s best to start with literally just a couple of drops and then add one drop at a time, to taste. Here, I’m sharing my Greek appetizer recipes—plus one for a hybrid Greek/Israeli baklava—to enjoy as a light, late summer supper or party menu. It may seem inauthentic to swap Greek yogurt for sour cream here. You could use Greek yogurt, I just happen to prefer the taste of the full-fat sour cream. This is the same base recipe I use to make fresh-herb-packed Mediterranean ranch dressing, which my family eats on a regular basis. 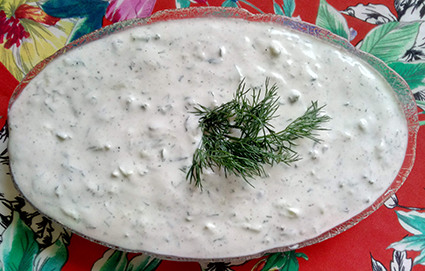 While the ranch version features fresh garlic, dried oregano, fresh basil, fresh dill, fresh parsley and sometimes za’atar (fresh or dried), it only takes nixing all the other herbs aside from the dill—and adding shredded cucumbers—to turn it into tzatziki. In a medium bowl, whisk sour cream and mayonnaise until smooth. Season with salt, pepper and vinegar, then add grated garlic and chopped dill. One of the biggest misconceptions of a society that buys most of their food in supermarkets is how easy it is to make staple foods at home. Consider ricotta cheese: This fresh cheese requires only two ingredients and minimal technique. If you can warm milk, you can make ricotta, and let me tell you, once you have a freshly made bowl of it drizzled with honey, you won’t believe how good it could be. Pour milk into a large saucepan and heat over medium heat until it just begins to boil. Turn off the heat and add the vinegar. Lightly stir to combine, fit the pot with a lid, remove it from the burner and let it sit unattended for half an hour. Place a fine mesh sieve over a large bowl and place a cheese cloth or lightweight muslin cloth, such as a baby swaddle blanket, inside the sieve. Set aside. After half an hour, the milk solids will have separated from the liquid. Pour the milk mixture into the lined sieve, letting the bowl below catch the excess liquid. Pour this liquid out into the sink, to make sure that the cheese is not touching any liquid through the bottom of the sieve. Gather the edges of the cloth, and tie to let all extra liquid fall out. Let drain for 5 minutes, before transferring the contents of the cheese cloth to a bowl and letting it chill in the fridge. The cheese will be good for 1 week. One of my new favorite ingredients is chard leaves. They function in recipes just like spinach, only without all the annoying side effects of spinach: shrinking, taking on a muddy flavor when frozen and expelling copious amounts of water when used in recipes. But chard leaves cook up fast, hardly shrinking at all, and let off just the slightest amount of water while having the most tender, silky leaves. Plus, they are one of the most nutritious vegetables available, having more protein, fiber, calcium and iron than kale. 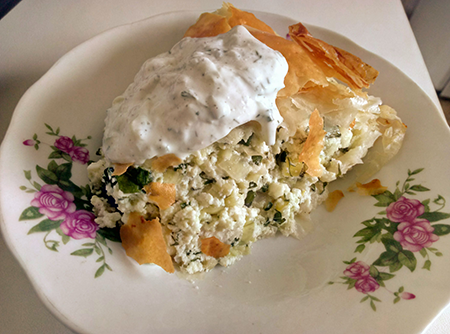 Here, together with sautéed leeks, salty feta cheese and fresh ricotta, this phyllo dough-based Greek dinner pie is healthy and fresh enough to make up for the butter-brushed dough that encases it. Make fresh ricotta cheese (recipe above) and set aside to cool. You can also use store bought ricotta if you prefer, and skip this step. In a frying pan, heat 3 tablespoons olive oil. Cut the dark green stalks off the leaks and cut the remaining leek in half lengthwise. Fan out the sections and rinse well under cold water to remove any sand. Slice leeks thinly and sauté until translucent (2-3 minutes). Set aside to cool. In a large bowl, crumble the feta cheese. Separate the leaves from the stalks of the chard and chop. Add to the feta cheese. Chop and add the fresh dill, pepper and garlic, then add the cooled ricotta cheese. Stir to combine and add the egg to bind the mixture. Grease a 10-inch round deep pie dish with a little of the melted butter. Open up the defrosted phyllo dough and separate the phyllo one sheet at a time, laying each sheet down in the pan and brushing with melted butter. With the first sheet you might find it easier to use a dabbing motion when applying the butter with your pastry brush. Also, don’t worry if the sheet is bigger than your pan size. Simply fold in the sides, tack them down with butter, and continue. Repeat until you have a total of 7 layers of butter-brushed phyllo dough laid down in the pan. Add the filling by pouring it over the phyllo base and spreading it out evenly with your hand. Repeat step 10, again layering 7 sheets of buttered phyllo dough on top of the filling. For the last layer you can trim the edges to get a uniform top. Cut three vertical slits in the pie to allow steam to escape. Brush the top layer with butter. Bake for 45-50 minutes, until golden brown on top. Let rest 10 minutes before slicing and eating. This baklava is multinational, inspired by all the places I’ve ever eaten this treat, including Israel, Greece, Jordan and Turkey. It is the result of extensive research and observation, different techniques and advice from which to draw. Baklava-making is really an art in and of itself within the pastry world. I still find plain old walnuts, as used here, to be the most satisfying nut to use, flavor-wise. Melt butter for the baklava in a microwave proof bowl and set aside. Make the syrup: In a small sauce pan, combine sugar, water, cinnamon stick and orange blossom water (or rose water, if using), and bring to a boil. Turn down the heat and let simmer gently until the sugar has dissolved, then continue to cook for 2-3 minutes, until the syrup is thickened. Do not stir, to prevent the sugar from crystalizing. Set aside to cool completely (It is very important that the syrup be room temperature when it goes on top of the hot baklava later on, to help with absorption). Brush a 9 X 9-inch baking pan generously with the melted butter. Open up your package of phyllo dough sheets, and place the sheets under a damp dish towel. Lay one sheet of phyllo dough down in the pan at a time, brushing each sheet with melted butter, before layering on the next. With the first sheet you might find it easier to use a dabbing motion when applying the butter. Also, don’t worry if the sheet is bigger than your pan size. Simply fold in the sides, and tack them down with butter and continue. Repeat 5 additional times until you have a total of 6 layers of butter-brushed phyllo dough laid down in the pan. Add the filling by pouring it over the phyllo base,and spreading it out evenly with your hand. Layer 6 more sheets of buttered phyllo dough on top of the filling. For the last layer, trim the edges to get a uniform layer. Brush the top layer with butter. 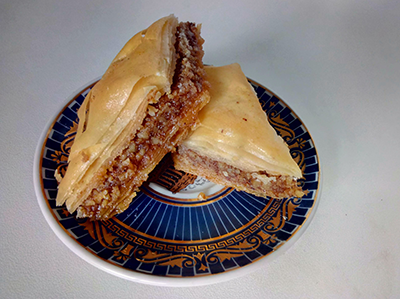 Place the baklava in the freezer for 20 minutes to chill thoroughly, then take it out and cut into 2-inch squares, piercing down to the bottom layer. 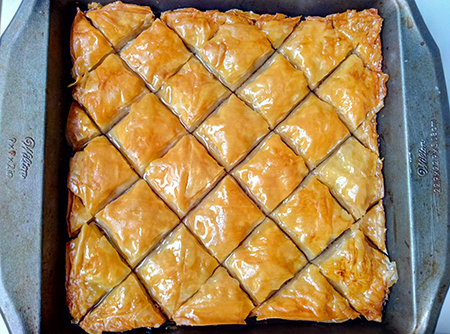 To get diamond shapes, first cut diagonal lines across the baklava and then cut the same number of straight up and down lines. Use the tip of your knife when cutting and go slow to avoid damaging the delicate phyllo layers. Bake the baklava for 50-60 minutes, or until the top is golden brown. Take the baklava out of the oven and immediately spill the room-temperature syrup evenly over the top. Let steep for 4-6 hours to absorb all the syrup and soften the phyllo. Serve and enjoy. Sephardic Jews use oil instead of butter. Maybe because this is the baklava my mother made, I prefer the taste of baklava made with oil. Heat briefly oil in the microwave. Warm oil is less viscous than room temperature oil and spreads more easily. I serve baklava on Rosh HaShana after a meat meal. Don’t forget to add a few drops of lemon juice after the syrup is cooked. The acidity cuts down the cloyness of the syrup. Thanks for the interesting variation. Sounds great! L’Shana Tova.